Some morph creatures mimic spell effects that could be useful. Nantuko Vigilante and Ainok Survivalist for removal, at least. Misc. : Drop - Angler Drake, Exclusion Mage, Ezuri's Archers, Filligree Familiar, Mercurial Chemister, Ornithopter, Spawnwrithe, Pelt collector, Tilonalli's Summoner, Warbreak Trumpeteer, and Wildfire Eternal. Add- Cloud of Faeries , Great Whale , Temur Sabertooth (and Equilibrium / Tidespout Tyrant mentioned above), Fierce Empath , Den Protector , Stratus Dancer , Ainok Survivalist , Ogre Battledriver , and Momir Vig, Simic Visionary . Also, you 100% need to put Ancestral Statue in. Targets itself with its' own ETB and goes infinite due to eventually costing nothing to cast. I have a few suggestions, I'll try to categorize like you. 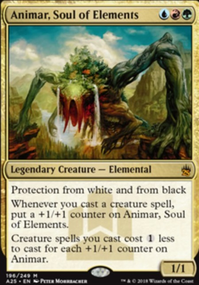 Animar Counters - Consider Hardened Scales. Clone - Phyrexian Metamorph, Stunt Double, and Phantasmal Image are all great here. I want to add Bane of Progress. 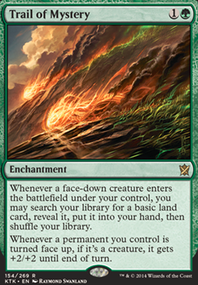 What would you cut from your list if Bane of Progress was not in the deck? I want to keep Caustic Caterpillar and Ainok Survivalist in my list. You are playing Reclamation Sage in place of Caustic Caterpillar. If you could only play one of card between Surrack Dragonclaw, Urabrask the Hidden, and Vorinclex, Voice of Hunger, what would it be? Is Sea Gate Oracle in your tuned list? Do you think it has a place in this list? Iquasi, thanks so much for the detailed reply. I understand your reasoning for running Sakura-Tribe Elder, Burnished Hart, and Solemn Simulacrum. My list replaces those with Mox Diamond, Chrome Mox, and Wild Growth (just added). I am playing all the good one mana dorks. I am playing all the counterspells that you are. Heroic Intervention seems great in theory as board wipes are very common in my meta. It would seem that Heroic Intervention could be a backbreaker as everyone's board is cleared while you are sitting pretty. It was just added so it may prove to be good only in theory. Balefire Dragon seems to be very similar to Pathbreaker Ibex, which I cut. They are very impactful cards IF they get to swing. There is rampant spot removal in my meta. I am doubtful that they survive to my following turn. Maelstrom Wanderer is a pet card of mine as it was the first commander deck I built. My deck has to have some more aggro elements as I am not playing Ancestral Statue. Wanderer gives me cascades and haste to the whole team. 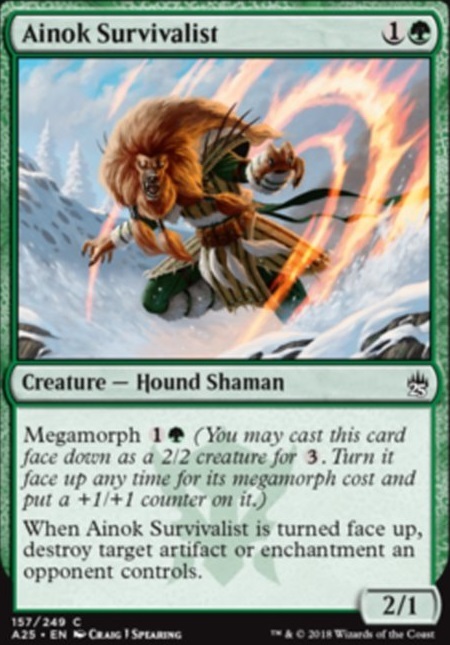 Ainok Survivalist along with Caustic Caterpillar are my artifact /enchantment removal. Bane of Progress is on my watch list. Purphoros, God of the Forge and Walking Ballista are in my list. They are good outside of being the second piece of the Ancestral Statue combo. Frank, thank you for taking your time to write! If you could provide me with a link to your decklist I could maybe offer more assistance, but I'll try to reply to your points now. But first I must say a few words on the design of this deck. This list is far from being the most powerful Animar list out there and that is entirely intentional: my regular playgroup with long-time friends is not the most competitive and since this list was designed for that environment I have on purpose omitted a number of traditional Animar key cards such as Survival of the Fittest and the fast mana such as Mox Diamond, Chrome Mox, Mox Amber, Utopia Sprawl and one mana ramp dorks. If I were to power up the deck, I'd start with adding more fast mana and tutors. Ancestral Statue I would recommend running as an 'emergency win button' for those games that last for hours. If you feel like adding more power, add Purphoros, God of the Forge and/or Walking Ballista, but even Statue itself helps put games away with arbitrarily large Animar attacking. Part of the reason for me running Sakura-Tribe Elder, Burnished Hart and Solemn Simulacrum is that my meta runs quite a lot of removal, and these cards listed above all leave something behind in the case of Animar leaving the table. Since Animar draws quite a lot of hate I've tried to include cards that provide value even without Animar on the table. Gilded Drake is a card I play in my 100% tuned combo-Animar list, but here I have omitted it for power level reasons. Caustic Caterpillar is nice, but I prefer running Ainok Survivalist over it since it synergizes better with Cloudstone Curio. I had Maelstrom Wanderer in the deck for a while but I eventually cut it for Balefire Dragon because in this list Wanderer can hit something fantastic, but more often than not it hits random 1- and 2-drops that don't really affect the game at all, so I cut it. The dragon does a lot of work in my meta: all players play creatures and having access to one-sided sweeping effect is just too good to pass. The Dragon is also handy in the 7-drop slot because of Birthing Pod. Tutoring up Bane of Progress with Imperial Recruiter, playing it blowing up everything and saccing it to Birthing Pod the next turn is one of my favorite lines in this deck :) With haste effects Balefire Dragon is just too good to pass. 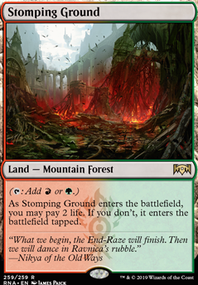 If you don't have it I'd recommend adding it if your meta runs slower creature decks like mine does. Bane of Progress is one of the Imperial Recruiter toolbox creatures that I have found very useful. This deck runs only a tiny number of artifacts or enchantments so it is basically a one-sided board-wipe. Heroic Intervention I have just found inferior to counterspells. Intervention doesn't stop Toxic Deluge or Living Death but Mana Drain does. Then again against Supreme Verdict counterspells look pretty awful, but I think your deck would be better off with counterspells if your mana base allows it. Spellseeker is a card I have considered, but it might be too strong for this meta. I do run it in my 100% powered list and I just love it. Hardened Scales is a card I am considering at the moment and you might see it quite soon in my list :) It is a good card but I'll have to see if it is too strong.